Founded in 1973, the CSI, the Computer Security Institute is the first ever membership organisation dedicated specificly to Information Technology. It has about 5000 members worldwide. According to John O’Leary, its Director for Educational Programs, this Association is « open to individuals working for companies, some very technical, some managerial and some in administration business. All members are interested in fostering the cause of IT Security. Any government agency are there, not just in the US. However it is more corporate than agencies, with also scientists as well as business management persons». John, it is a great pleasure to have you in Paris. Before starting our questions game, we would appreciate to get a few words on the reason why you joined Eurosec again. John O’Leary : I try to come evry year and try to get and bring a worldwide perspective. As we serve international firms, I want to know what realities are in the different parts of the world, for me and my classes. Last year at the AMCF meeting in New York, Lanny Cohen from Capgemini unveiled that RFID would certainly be the next breakthrough in supply chain and retail, and at least a growth relay for IT after the end of blockbusters like Y2K, Euro or ERP deployment... You gave this year a lecture and participated to a round table on RFID, so as most of us dont know what that technology is all about, may we have an introductory word ? Any relation with the Barcode ? John O’Leary : Well you must understand that the RFID tag activates only but cannot be asked for special purpose. And there lies the real danger as long as you dont know when and what it transmits. You can carry something without knowing the system enter a read zone. So you mean there is a real privacy problem ? So what can we do and what a specialist would recommand ? John O’Leary : We can make sure that the act of scaning deactivates the tag or have a portal for deactivating. Another possibility is time deactivation but it is expensive and make trouble with the inventory activity. We can also reactivate but it is not safe, your security profile being lowered. If we reactivate and it does not work it is not a problem of privacy but of safety. What extent this priacy/safety problem can reach ? John O’Leary : We can imagine that you can have the lecture of your access card if someone can read the information. The problem of security is linked to the wireless transmission ans so far data are not encrypted. May we change the content of such RFID tags, or have the content changed by someone without knowing it? What difference with a credit card or any card of that sort ? So the safety question keeps open. What about the expected market for those devices ? John O’Leary : It is going to be very large. But we dont know it at the moment. It is potentialy huge if you consider that any item comes with a tag ! WallMart for instance or Target or JC Penney are forcing their suppliers to use RFID tagging on skids they send. Nearly 100 of the largest suppliers have been asked this year on January. All suppliers to be on those big accounts will have to comply. John, we slightly shifted from the customer to the supplier. That’s intersesting. Is RFID intrinsically more devoted to supply chain than retail ; in other words to B2B than B2C, with maybe less privacy problems? John O’Leary : Oh, B2B might work fine. But tags will continue to work after delivery... It is going to be common in B2B and lead to troubles in B2C. Procurement, Supply and Retail are rapidly changing in a world of growing services. We have recently seen Accenture buy a Marketplace it contributed to develop, namely CPGMarket. How RFID is going to impact the way we order on the internet, be it B2B or B2C ? John O’Leary : Well, marketplaces, portals, it is all a matter of correct time and cost saving. Eliminating the need for warehouses which is costly. RFID is going to cover this entire supply chain as a part of the IT system. John O’Leary : It will be a product for consultancies and a driver of hiring for the next 5 years in a definitly growth area : distribution, supply -chain and purchasing. John, your institution is located in Plano Texas, a State made famous for spaceactivity as well as IT through the Texas Instrument Company. We heard that TI might lead the RFID supply market. John O’Leary : Toyota and Ford will use tags, start-up keys and anti theft that come from TI. Editors of supply-chain softwares seems to be out of the RFID business. Your viewpoint? John O’Leary : Right now it is not a large market. As they will see the market grow they will step in! The reason it is taking off in the US is that WallMart as well as DoD (the Department of Defence) are asking for the device for all purchasing. This in turn trigger the market and makes safety mandatory. In military applications you need the capability of turning off the tags in unsecure areas. The concept is simple but implementation is complex, which explains the slow start. During the round table VerySign as been quoted a few times. Could you explain the relation between the PKI companies and the RFID issue ? John O’Leary : At the origin you had two companies in PKI business (private and public keys, certification, repudiation) : Entrust and Verysign. They picked-up PKI to make money on the internet. If we use PKI in tagging we can look at encrypted data which is safer. This is when they comes in. Verysign wants to improve the protection of the data and take a piece of the cake. John O’Leary : Right. WallMart is setting the standard by default. Also some others as the DoD. 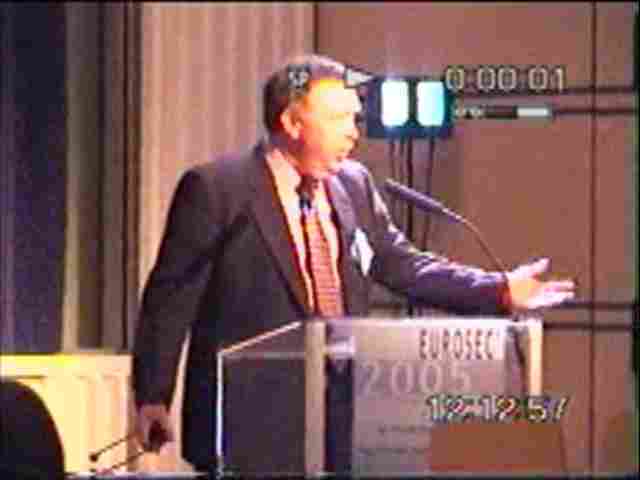 As a conclusion of Eurosec 2005, what would be your main advice on RFID tagging ? John O’Leary : Get ready because it’s coming ! It will come at your organization whoever you are, and privacy is the fear.